When I was in Mexico I had a fabulous margarita made from the local Gondos Berries (Ardisia Compressa Kunth) which grow in the area of Puerto Vallarta and Cabo Corrientes. The mix of this berry and the local blue agave drink called Racilla, not Tequila, was just wonderful! It’s not called Tequila, for like Champagne, it can only be called Tequila if it’s made from the blue agave plant and surrounding the City of Tequila! That’s me told then! So in El Tuito, it’s called Racilla, the local moonshine. It sounds so lovely and dangerous! Racilla! The Gondos Berry is a gorgeous rich dark purple colour. It reminded me of blueberries but with a serious wow tart blast! It has an odd taste that I fell in love with. The closest I can describe it as reminding me of a blueberry in colour, yes, but then almost an all spice taste- bordering on nutmeg and maybe a threat of cinnamon without any added sugars. It needs some seriously strong taste buds to eat on its own, but pop it into a margarita and I am there! It was a good balance, spicy and sweet and the mellow effects of the local Tequila. This berry is something you must try if you are in this area. The plant has lovely yellow flowers that burst into colour in late winter and then produce fabulous little purple berries in the spring time. It can be used to make wine, Aqua Fresco, (where the berries are soaked and the water drained off to make a lovely dark rich tea,) or if you really feel industrious, jam with loads of sugar! My vote is for the Gondos Margarita! I am not a great believer of labelling things as cures, or cure alls, but I’ve read that the local people believe it helps with coughs, and liver problems. It’s super rich in tannins and would make a fabulous wine. Sadly I didn’t get to taste any, but then again, my Magarita was enough for me! Apparently in the laboratory, the leaf has the ability to inhabit cancer of the liver and a great tea for those recovering from alcohol abuse. Hmmmm does that cancel out the effect of my lovely Margarita? Never take all the berries, leave some on the plant for the birds and wildlife, and for the plant to reseed. Medical note….all medical comments are just that comments, as I am in no way a scientist or a medical doctor. But I do like a decent Margarita! Gallery | This entry was posted in Memories and musings and tagged all spice, Ardisia Compressa Kunth, Blueberry, Cabo Corrientes, cinnamon, El Tuito, El Tuito Mexico, Gondos, Herbal Remedies, Herbs, margarita, medicinal, Mexico, moonshine, nutmeg, Puerto Vallarta, Racilla, Rancho Primavera. Bookmark the permalink. It was my first experience. I tasted them raw, just picked, and wow, talk about mouth puckering! I would want my berries with honey perhaps? But as a drink, or pudding, they have such a unique spicy taste, I can’t wait to have Gondos Berries again! 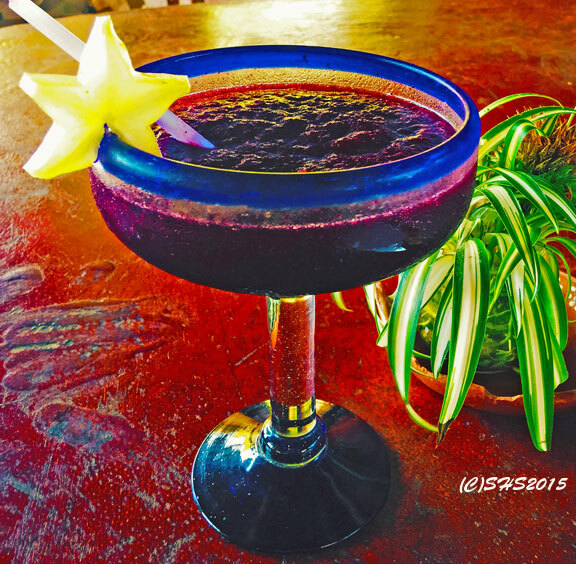 Hi Susan – first – your photo screamed Mexico to me – the vibrant colors – not just of the berry marg, but the glassware, table, etc,. – just so rich. Also, very interesting to hear about the liver tonic made from these – and I do believe in some healing herbs – (like how milk thistle can help clean out and heal scars on the liver too- and only sharing for educational purposes too – but some natureopaths that I really respect suggest Nature’s Way Thisilyn formula for anyone who wants to have liver support).